13,001 miles no accidents! Car is absolutely flawless has all the bells and whistles. This is one of the hottest colors for the Lamborghini. Car has a formula one exhaust. Has all manuals and tools. Comes with silk car cover. This is a 13k mile car not a 50k mile car. The clutch has 85% left. Not interested in any trades and no negotiation on price. If you're interested in a cheaper one with higher miles, please pass on it. If your feedback is lower than 10 email me to bid. Price is $89,999. 1987 Lamborghini Countach VITALS Year Make Model Mileage 1987 Lamborghini Countach 8,986 Exterior Interior Stock # VIN Black Tan X00010 ZA9CA05AXHLA12185 Engine window sticker PHOTOS DESCRIPTION 1987 Lamborghini Countach 1987 Lamborghini Countach The Lamborghini Countach is perhaps the most iconic supercar of the last 30 years. It decorated the walls of a generation of young car fans in a poster known to most, and it helped define an era of supercar excess. Several decades later, it is certainly still the stuff of exotic car dreams for many car aficionados. The Countach made its public debut in 1971 at the Geneva Motor Show. The design of the ultra-low two-seat sports car took the world by surprise. Perhaps the most captivating styling elements were the famous scissor doors, swinging up and forward. Over the years these doors have become a consistent Lamborghini design feature. The Bertone-designed legend grew ever more extravagant as engineers sought various measures aimed at keeping it pinned to the road in response to the ever-increasing power output from its refined V-12 powertrain. Bored-out to 5.2-liters for 1985, the V-12 was also given four valves per cylinder, for a total of 48, hence the moniker “Quattrovalvole”. European-specification Countach models gained six Weber downdraft carburetors located on the top of the engine, rather than from the side, while North American models received Bosch's K-Jetronic fuel injection system. The V-12 engine is paired with a five-speed manual transmission. The shift mechanism is gated for smooth and accurate gear changes that are essential for maximizing the cars speed potentials. The Countach Quattrovalvole received small bodywork changes in late 1987; new streaked sills incorporating rear brake cooling vents were added. The interior was now equipped with central-locking, modified heater controls and much improved ventilation. The huge rear wing could still be ordered on the Quattrovalvole, and few Countach left the factory without one. The truth is that the Countach does not suffer from aerodynamic lift at high speeds, so the rear wing was not a necessity, but added a great deal of conversation to the design and the car being immediately recognizable to all but a few. The wing was an expensive option at about $5,000, but with the increased drag created a slightly lower top speed. This exhilarating car has been in the same family since new and is presented in original condition, with less than 10,000 miles displayed on the odometer. This Countah is finished in a sinister black paint with an exquisite biscuit-toned leather interior. This example is reported to be exceptional. Attractively equipped with the classic phone dial-style alloy wheels and tall rear spoiler, air conditioning, Alpine AM/FM stereo radio with cassette, tinted glass, remote mirrors, driving lights and power four-wheel disc brakes. Present are the books that include warranty and maintenance information. Additionally there is the driver’s handbook, owner’s manual and parts catalog binder. Documentation includes the original window sticker and service record from October 1989, as well as September, October and December of 2008. DEALER CONTACT Lamborghini Paramus Ask Dealer A Question If you have a question, please call or complete the form below for a quick response. Name Email Phone Question(s) SHIPPING Lamborghini Paramus proudly recommends MoveCars.com for your vehicle transportation needs. MoveCars.com contains a directory of transportation providers servicing the US, Canada and beyond. Get your Free Quotes Now at MoveCars.com! View more info » About Lamborghini Paramus The Prestige Family of Dealerships is exceedingly proud to announce the opening of its brand new Lamborghini showroom in Paramus, NJ. Lamborghini Paramus, is the latest in the almost 50-year history of excellent Prestige dealerships in the Tri-State region. Lamborghini is a superlative Italian sports car brand that represents the very best in design and engineering. It takes a great deal of knowledge and experience to represent the Lamborghini name in the U.S., and the Prestige Family of Dealerships is one of the few in the country that can easily rise to the challenge. Whether you are in the market for a new or pre-owned supercar, Lamborghini Paramus is your Northeast headquarters for every available Lamborghini and preowned exotic vehicle, part and accessory. Contact our specialist today and make an appointment to test-drive one of mind-bending supercars at Prestige Lamborghini Paramus – it's an experience you'll never forget! TERMS & CONDITIONS Terms of Sale Auction Close: Successful "winning" bidder must contact seller within 24 hours after the auction has ended to verify purchase and make arrangements to complete the transaction. Within (4) business days of the end of auction, full payment must be received either by cashiers-check, approved bank draft, or certified funds. If funds are not received, and an alternate arrangement has not been made, the vehicle can and will be made available to other potential buyers on a first-come, first-serve basis. Vehicle Transportation: Prestige Motors, Inc. values your business! We want you to be completely satisfied with your online automotive experience from purchase to delivery. However, Prestige Motors is not responsible for shipping and transport arrangements but we will assist you. All shipping charges are the "Buyer's" responsibility. We will help with shipping arrangements but will not be responsible in any way for claims arising from shipping damage. Licensed "Carriers" are generally insured for $500,000. We assume no responsibility for damages incurred after the vehicle leaves our showroom. All shipping arrangements provided by us are strictly a courtesy. We are not affiliated with any carrier. Any claims or other communication regarding shipment of vehicles will be between you and the "Carrier" and not with us. The amount of time it takes for delivery depends upon the "Carrier" selected. A typical experience is 7-14 days from the date the vehicle is picked up from our facility until it is delivered to your destination. Verify with the "Carrier" for an Estimated Time of Arrival to be sure. Payment: Prestige Motors, Inc. accepts cashiers’ checks, certified funds, or verified drafts from known/approved financial institutions. Financing is available to qualified customers however it must be completed before end of auction. All buyers pay a $389 documentation fee. All buyers will be charged applicable sales tax, DMV fees and registration fees for State the vehicle will be registered in. New Jersey Residents pay 7% Sales Tax and Registration Fees. Out of State buyer may register and pay applicable taxes in their home state. Warranty: Many of our vehicles include a Prestige Pre-Owned Limited Warranty at no cost. This is a 2 Year/100,000 mile limited warranty. Please ask us for any details. Some vehicles will have factory warranty remaining (will be stated in our description). Some vehicles may qualify for warranties at additional costs(call for details) All cars come with one master key unless otherwise stated. Vehicles come with books and/or manuals only if pictured in photo gallery and/or if stated in the ad. If there is no stated warranty on the vehicle then it will be sold ‘As-Is’ with no warranty. Disclaimer: * We make every effort to present information that is accurate. However, it is based on data provided by the vehicle VIN decoding and/or other sources and therefore exact configuration, color, specifications & accessories should be used as a guide only and are not guaranteed. Under no circumstances will we be liable for any inaccuracies, claims or losses of any nature. Furthermore, inventory is subject to prior sale and prices are subject to change without notice. Prices do not include taxes, registration fees, finance and/or documentation charges, or shipping fees. To ensure your complete satisfaction, please verify accuracy prior to purchase. * Odometer Readings: Due to demo test drives and mechanical inspections, the mileage of the vehicle represented might be slightly different than the mileage stated when the vehicle was first listed on eBay. * Buyer's Inspection: We do our best to disclose all information known about this vehicle for auction. We welcome a Buyer's Inspection. If you plan to have a Buyer's Inspection, please make sure you have the vehicle inspected prior to the end of the auction. Inspection fees, if any, are the "Buyer's" sole responsibility. Ad created byeCarList.com.Call 214-722-8200 to find out how Dealertrack Inventory+ can service your dealership. Photo Viewer 2004 Lamborghini Murcielago ASK SELLER QUESTION Vital Information Year Make Model Mileage 2004 Lamborghini Murcielago 17,994 Exterior Interior Stock # VIN Yellow Black A01022 ZHWBU16SX4LA01022 Engine 6.2L DOHC 48-Valve Mid-Mounted Aluminum Alloy 12-Cyl Engine view window sticker Carfax Highlights View Carfax Report Not all accidents or other issues are reported to CARFAX. The number of owners is estimated. See the full CARFAX Report for additional information and glossary of terms. Carfax Highlights No Accidents / Damage Reported to CARFAXNo Airbag Deployment Reported to CARFAXVehicle Qualifies for the CARFAX Buyback GuaranteeNo Structural/Frame Damage Reported to CARFAXNo Manufacturer Recalls Reported to CARFAXNo Indication of an Odometer RollbackNo Total Loss Reported to CARFAX View All Photos Description 2004 Lamborghini Murcielago 2004 LAMBORGHINI MURCIELAGO COUPE! CLEAN CARFAX REPORT! AUTOMATIC! PERAL YELLOW WITH BLACK VALOUR SEATS! 17K CARFAX CERTIFIED MILES! NEVER SMOKED IN! WE SERVICE/SELL LAMBORGHINI AND ALL OTHER MAKES! FINANCING AVAILABLE! CALL BRYAN 9416005220 This vehicle qualifies for super-low rates through our finance programs. For out-of-state buyers we help arrange low cost auto shipping. If you have any questions regarding this vehicle, please feel free to call us at 941-924-5885 or email us at sales@scottisautos.com Scotti`s Auto Sales has established a rich legacy of offering the highest quality used cars is Sarasota, Florida. With this in mind, Scotti`s Auto Sales is proud to offer you these vehicles at a tremendous savings. Good luck and congratulations on your purchase! SCOTTIS HAS AN A+ RATING WITH THE BETTER BUSINESS BUREAU. https://www.youtube.com/watch?v=gRc9ZhYTf3A&feature=youtu.be A.S.E. Certified Technician Inspected. **PRICED BELOW RETAIL TO SELL FAST** @@BEST DEAL IN TOWN!!!!!!! Call 941-924-5885 Need Financing? Apply Through Our Secure Link. Hablamos Espanol Schedule a test drive or just come and visit us - Apply for credit Warranty: Certain restrictions may apply..Ask for details Selling price does not include: tax, tag, title, registration, adm. fee, or any other fees related to transfer of ownership. Please Understand Our Vehicles Are Pre-Owned, Sometimes They Come Without: Extra Keys, CD Magazines, Navigation Discs, Owner`s Manuals, Floor Mats. We Will Happily Order Any Parts/Accessories For You At An Additional Cost. **Scotti`s Auto Repair And Sales Inc. reserves the right to sell this vehicle at anytime, Contact us to confirm availability. We do our best to advertise equipment, packages, options and condition correctly, however, we are not responsible for typographical errors, omissions, or inconsistencies. Contact us to verify all equipment stated or perceived as well as any questions regarding condition. Scotti`s Auto Repair And Sales Inc. will not be liable for mistakes, errors, omissions or issues otherwise associated with Internet vehicle listings, Contact us to verify prior to making your purchasing decision.. Price Disclaimer: Prices subject to change without notice** *Restrictions may apply Contact Us Dealer Contact Scotti's Auto Sales Carfax Standard Equipment EPA FUEL ECONOMY RATINGS City 9/hwy 13 (6.2L engine/6-speed manual trans) EXTERIOR Front/rear air dams Pwr folding heated mirrors Variable intermittent single arm windshield wiper Tinted glass Electronically controlled 3-position rear spoiler Vertically opening "gull-wing" doors Xenon High Intensity Discharge (HID) headlights INTERIOR Pwr door locks w/center console mounted switches Trip computer w/average speed, miles to empty Pwr windows w/center console mounted switches Instrumentation-inc: speedometer, tachometer, fuel gauge, coolant gauge, voltmeter, digital clock Dual front bucket seats w/manual lumbar support Leather wrapped adjustable steering wheel Center console storage w/armrest Remote decklid release Leather seat trim Rear defroster Dual storage pockets on doors Full floor carpeting Electrochromic rearview mirror AM/FM stereo w/CD changer Single zone automatic climate control system Anti-lock brake/air intake system warning lights In-glass antenna MECHANICAL Variable-geometry intake system (VIS) Brembo front/rear ventilated discs w/aluminum alloy 4-cyl calipers/pwr H vacuum system "Drive by wire" electronic throttle control Antidive & Antisquat systems Limited slip front/rear differential 18" x 8.5" alloy front wheels 26.4 gallon fuel tank Electronically controlled intake & exhaust variable valve timing (VVT) PMC electronic control unit for VACS & rear spoiler adjustment 245/35ZR18 Pirelli P Zero Rosso SBR front tires Variable air flow cooling system (VACS) Honeycomb carbon fibre structural elements High strength steel alloy tube chassis frame 6-speed manual transmission w/OD 6.2L DOHC 48-valve mid/longitudinal-mounted aluminum alloy 12-cyl engine 335/30ZR18 Pirelli P Zero Rosso SBR rear tires 18" x 13" alloy rear wheels Dry sump lubrication system Dual chrome exhaust tips Independent double wishbone front suspension w/coil springs Shock absorbers w/manual & automatic electronic damping control Lamborghini electronic engine management (LIE) Pwr 4-wheel disc brakes Indpendent double wishbone rear suspension w/coil springs, stabilizer bar MPFI fuel injection system w/individual static ignition All wheel drive SAFETY Height adjustable 3-point seat belts w/belt pretensioners Traction control Driver & front passenger airbags w/occupant sensors Dynamic Rear Proportioning (DRP) 4-channel anti-lock braking system (ABS) Secure Online Credit Application Applying for a vehicle loan online is one of the quickest and easiest application methods. Our secure online application form is easy to complete, all you need are a few personal and employment details. Get started now. Shipping Scotti's Auto Sales proudly recommends Earth Auto Shippers for your vehicle transport. Earth Auto Shippers is a fully licensed vehicle shipping company. Earth Auto Shippers offers "door-to-door" low-cost shipping services using enclosed and open trailers. View more info » SCOTTIS AUTO SALES https://www.youtube.com/watch?v=gRc9ZhYTf3A&feature=youtu.be Scotti's Auto Sales Is A Family Owned Business And Has Been Serving Sarasota For Over 30 Years. We Service And Sell All Types Of Vehicles Including BMW, Mercedes, Audi, Porsche, Volkswagen, And More! Most Of Our Vehicles Come With Warranties. We Offer Financing For All Types Of Credit. Sell Your Car To Us At A Fair Market Value! Scottis Repair Center Is Now Located Next Door At 3855 S. Tuttle Ave. We Take Pride In Fully Servicing Vehicles In Our World Class Service Department! SALES 941-924-5885 Ext#1 SERVICE Ext#2 Recommended Links Scotti's Auto Sales recommends financing from Esurance, Travelocity, Priceline and My Auto Loan. Please click below to apply online. Ad created by eCarList.com. Call 214-722-8200 to find out how eCarList can service your dealership. 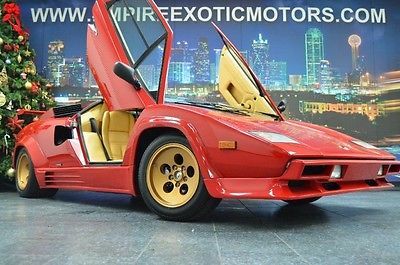 Photo Viewer 1988 Lamborghini Countach VIEW OTHER AUCTIONS ASK SELLER QUESTION Vital Information Year Make Model Mileage Engine 1988 Lamborghini Countach 29,661 Exterior Interior Stock# VIN Rosso Cuoio Naturale #A12315 ZA9CA05A0JLA12315 Description 1988 Lamborghini Countach 1988 LAMBORGHINI COUNTACH BRAND NEW LAMBORGHINI CLUTCH!COMPLETE ENGINE OUT JUST COMPLETED! AS WELL AS THE DASH GETTING A COMPLETE MAKEOVER! As for other markets, 1987 and 1988 model Quattrovalvoles received straked sideskirts and a mere 610 cars were built. BRAND NEW LAMBORGHINI CLUTCH!COMPLETE ENGINE OUT JUST COMPLETED! AS WELL AS THE DASH GETTING A COMPLETE MAKEOVER!When first introduced, the Countach took automotive design and engineering to a whole new level. PAINT IS ORIGINAL!BOOKS!SPARE TIRE!DOCUMENTED KILOMETERS ON TITLETOOLS!SERVICE DOCUMENTATION! Quite an accomplishment for an Italian tractor maker, but it became the icon for exotic styling predicting the angular style that became popular in the 1980’s. Add to that the powerful V12 engine, an understanding of how the driver and the car worked in unison and that too much was never enough, and the Countach became the car every car-aware kid had to have a poster of on their bedroom walls. In 1985 the engine was improved again, bored and stroked to 5167 cc and given four valves per cylinder—quattrovalvole in Italian, hence the model's name, Countach 5000 Quattrovalvole or 5000 QV in short. The biggest change under the hood was the introduction of fuel injection, with the Bosch K-Jetronic fuel injection, providing 414 bhp (309 kW; 420 PS), rather than the six Weber carburetors providing 455 bhp (339 kW; 461 PS) used in the previous carbureted models. WE FINANCE! This car is a MUST SEE!! 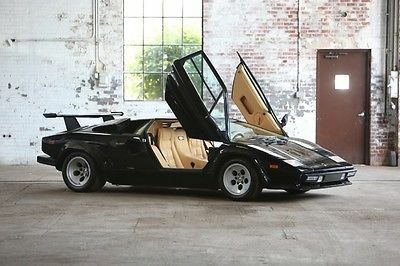 If you are considering a ONE OF A KIND 1988 LAMBORGHINI COUNTACH! CALL NOW FOR ADDITIONAL INFORMATION! As always, we welcome third party inspections! We offer finance options, We take trade-ins, free airport pick up, world-wide shipping, extended warranties, installation of additional desired items, and MUCH MORE! We are a full service dealership. DON’T SETTLE…GET THE BEST!!! We at EMPIRE EXOTIC MOTORS, pride ourselves in our customer service, and with 50+ years combined experience in the automotive industry, you get just that! We have been specializing in the automotive wholesale market, and now are bringing our one-of-a-kind service and prices to the retail market! This allows us to have the most aggressive pricing on our cars, saving you THOUSANDS below standard retail! So skip the games, head-aches, and high prices these "big name" dealerships give you that leave you questioning your purchase, and come to EMPIRE EXOTIC MOTORS! We guarantee your satisfaction with our easy, painless and FAST process that will have you on the road in no time enjoying your new car! We have also teamed up with multiple warranty companies to provide the best, lowest priced warranty options available, So feel free to give our team a call anytime if you have any comments or concerns. EMPIRE EXOTIC MOTORS, your source for pre owned exotic, luxury and performance vehicles! www.EMPIREEXOTICMOTORS.com Photos Contact Us Dealer Contact Empire Exotic Motors 15051 East Beltwood Parkway Addison, TX 75001 214-812-9395 Secure Online Credit Application Applying for a vehicle loan online is one of the quickest and easiest application methods. Our secure online application form is easy to complete, all you need are a few personal and employment details. Get started now. Below are a few of the other vehicles currently available from Empire Exotic Motors Shipping INQUIRE ABOUT DOOR TO DOOR SHIPPING. Premium Luxury & Exotic Cars At Empire Exotic Motors Inc. we have over 50 years of combined automotive experience. Here we pride ourselves on professional service and flawless delivery with each and every one of our great clients. From start to finish our goal is your complete satisfaction! Our stunning showroom is located in the beautiful city of Addison, TX but our vehicles and professional service reach all the way around the globe. No distance is too great or deal to small for us to overlook. So no matter if it is a car you've seen on our site, in our showroom or the one you've always been dreaming of. Come by today or give us a call at 214-812-9395, and let us serve your each and every car buying need! Empire Exotic Motors and it's representatives have made every effort to accurately and fairly describe the vehicle to you and disclose any known information regarding the vehicle. We will never describe a car as "perfect" and buyer should have expectations of "typical" dings and or chips and scratches that are consistent with the year and mileage on the vehicle. Buyers are provided with all additional items that were provided to us with the vehicle. Buyers are to expect that NOT all used vehicles will be provided with full sets of keys, books, CD magazines, Navigation Discs, floor mats or the like, NOR will all cars be accompanied by detailed service records etc. . Empire Exotic Motors will not be held responsible to provide any additional items other than represented as with the car unless detailed in writing by an authorized representative. Ad created by eCarList.com. Call 214-722-8200 to find out how eCarList can service your dealership. 2012 Lamborghini Gallardo Vital Information Year Make Model Mileage Engine 2012 Lamborghini Gallardo 3,220 5.2L DOHC DFI 40-Valve V10 Engine Exterior Interior Stock# VIN Grigio Lynx Metallic Arancio Leonis #CLA11925 ZHWGU6BZ8CLA11925 Vehicle Video Photos Description 2012 Lamborghini Gallardo Contact Prestige Imports today for information on dozens of vehicles like this 2012 Lamborghini Gallardo . If you're a driving enthusiast, you'll be grateful for the chance to drive this Gallardo convertible. You'll discover what millions of convertible owners have known for years -- nothing beats an open air experience. Clean interior? How about flawless. This Lamborghini Gallardo looks like has never been used. A vehicle as well-maintained as this Lamborghini Gallardo almost doesn't need a warranty, but you rest easier knowing it comes covered with the Lamborghini factory warranty. If you're looking for world-class speed, acceleration, cornering and handling, don't blink because you'll miss this truly amazing automobile. You can forget your phone at home, but thanks to this car you'll always have your navigation system. Buying a pre-owned vehicle shouldn't mean buying a vehicle with scratches, blemishes, and paint touch-ups. Fortunately, the paint on this 2012 Gallardo is as flawless as a new vehicle. A unique vintage vehicle that exudes taste and sophistication. More information about the 2012 Lamborghini Gallardo: The true value in the Lamborghini Gallardo rests along three lines: incredible, spine-tingling performance, a design that's a rolling work of art, and the kind of exclusivity that pads the personal image of those who already have everything. The Lamborghini Gallardo Coupe and Spyder (convertible) are powerful, flashy, all-wheel-drive supercars--and and they're among the fastest sports cars in the world, capable of topping 200 mph. And if the standard Gallardo just isn't hot enough for you, there are special Superleggera Coupe and Spyder Performante versions that are even lighter and better-performing--although at the expense of some comfort. Interesting features of this model are performance bragging rights, ready for the race track, Exotic styling, exclusivity, and all-wheel drive Contact Us Dealer Contact Prestige Imports Carfax Standard Equipment ENTERTAINMENT USB & iPod connectors in glove compartment AM/FM/CD audio system -inc: MP3 capability, radio data system, digital card reader, (4) speakers EXTERIOR P235/35ZR19 Pirelli P ZERO front tires Auto-dimming, pwr-adjustable, pwr-folding heated mirrors 19" Apollo polished wheels Tire repair kit Tinted glass Body-colored door handles Bi-xenon auto-leveling headlights w/washers Front & rear body-colored bumpers P295/30ZR19 Pirelli P ZERO rear tires Variable intermittent windshield wipers INTERIOR Nero Perseus, Leather seat trim Trip computer -inc: average speed, average fuel economy, current fuel economy, range Automatic dual-zone climate control system w/residual heat recirculation, carbon filter Remote trunk hatch release Driver & passenger vanity mirror Remote keyless entry Tilt/telescopic steering column Pwr remote fuel door release Alloy-trimmed shifter Lighting -inc: front reading, dome light w/fade, illuminated entry Instrumentation -inc: tachometer, external temp, digital clock, voltmeter, water temp, oil temp, oil pressure, trip computer, low tire pressure warning Auto pwr door locks Dual pwr windows w/one-touch up/down Front sport bucket seats -inc: 2-way pwr adjustment, head restraints Electrochromic rearview mirror Full floor console w/storage MECHANICAL 6-speed E-Gear automatic transmission w/manual shift -inc: automatic clutch, sequential shift, paddle shifters, automatic mode Limited slip rear differential Rear wheel drive Front & rear stabilizer bars 5.2L DOHC DFI 40-valve V10 engine Speed-sensitive-assist rack & pinion steering Adaptive aluminum front & rear double wishbone suspension -inc: coil springs, height-adjustable dampers, anti-dive, anti-squat, anti-roll bar Brembo 4-wheel ventilated disc brakes Lifting system PROCESSING-OTHER ** ORDERING INFORMATION IS 2012, OPTION & BASE PRICES TO FOLLOW ** **PRELIMINARY STANDARD EQUIPMENT** SAFETY 4-wheel anti-lock braking system w/electronic brake force distribution Viscous and brake traction control system LED daytime running lights Side airbags w/head airbag protection Driver & passenger multi-stage front airbags -inc: passenger airbag on/off switch Height-adjustable 3-point seat belts w/pretensioners Electronic stability control program Secure Online Credit Application Applying for a vehicle loan online is one of the quickest and easiest application methods. Our secure online application form is easy to complete, all you need are a few personal and employment details. Get started now. Below are a few of the other vehicles currently available from Prestige Imports About Prestige Imports Prestige Imports has served luxury vehicle owners of South Florida for more than three decades, and during this period has cemented its reputation as one of America's premier automotive retailers. The Prestige Imports family includes four premium vehicle franchises in North Miami Beach, including one of North America's leading Lamborghini dealerships and the nation's top-selling Audi dealership. In addition to its new vehicle offerings, Prestige Imports hosts an impressive inventory of luxury pre-owned vehicles from such esteemed brands as Aston Martin, Audi, Bentley, BMW, Ferrari, Jaguar, Lamborghini, Land Rover, Lotus, Maserati, Maybach, Mercedes-Benz, Porsche, Rolls-Royce and Saleen. To visit the Web sites of our dealerships, please select from the brand logos on this page or choose from the following links: Lamborghini Miami (Lamborghini) Prestige Audi (Audi) Lotus Miami (Lotus) Pagani Miami (Pagani) Feel free to follow us on Instagram: @prestigeimports Ad created by eCarList.com. Call 214-722-8200 to find out how eCarList can service your dealership. 2006 Lamborghini Gallardo Spyder Vital Information Year Make Model Mileage Engine 2006 Lamborghini Gallardo Spyder 29,989 Exterior Interior Stock# VIN Unknown Color #6LA03807 ZHWGU22T56LA03807 Vehicle Video Photos Contact Us Dealer Contact Prestige Imports Secure Online Credit Application Applying for a vehicle loan online is one of the quickest and easiest application methods. Our secure online application form is easy to complete, all you need are a few personal and employment details. Get started now. Below are a few of the other vehicles currently available from Prestige Imports About Prestige Imports Prestige Imports has served luxury vehicle owners of South Florida for more than three decades, and during this period has cemented its reputation as one of America's premier automotive retailers. 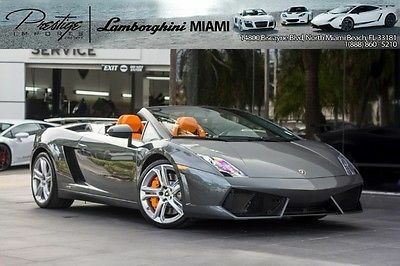 The Prestige Imports family includes four premium vehicle franchises in North Miami Beach, including one of North America's leading Lamborghini dealerships and the nation's top-selling Audi dealership. In addition to its new vehicle offerings, Prestige Imports hosts an impressive inventory of luxury pre-owned vehicles from such esteemed brands as Aston Martin, Audi, Bentley, BMW, Ferrari, Jaguar, Lamborghini, Land Rover, Lotus, Maserati, Maybach, Mercedes-Benz, Porsche, Rolls-Royce and Saleen. To visit the Web sites of our dealerships, please select from the brand logos on this page or choose from the following links: Lamborghini Miami (Lamborghini) Prestige Audi (Audi) Lotus Miami (Lotus) Pagani Miami (Pagani) Feel free to follow us on Instagram: @prestigeimports Ad created by eCarList.com. Call 214-722-8200 to find out how eCarList can service your dealership. Vehicle pick up by auction winner or shipping company is to be arranged at least 24hrs in advance for scheduling purposes. We are available normal business hours Monday - Friday and 9-3 on most Saturdays. We are not open on Sundays. Disclaimer ALL TRANSACTIONS ARE SUBJECT TO THE BIDDER AGREEING TO THE SELLERS TERMS AND CONDITIONS. THE TERMS AND CONDITIONS ARE REPRODUCED BELOW. TERMS AND CONDITIONS OF SALE Please review this document carefully as it sets forth legally binding terms and conditions relating to the transaction between you ("Buyer") and Sky Motor Cars ("Seller"). By signing below, you represent that you have reviewed the following and agree unconditionally. 1. Entire Agreement - The terms and conditions memorialized in this Sales Agreement comprise the complete, entire and final agreement between Buyer and Seller. No other terms, negotiations, proposals, representations, commitments, understandings or agreements between Buyer and Seller, either written or oral, shall be valid or enforceable, unless expressly contained in the Sales Agreement. The Sales Agreement may be modified or amended only upon express written consent of both parties. 2. "AS IS" - Buyer acknowledges that the automobile contemplated by this transaction is a used automobile and is offered for purchase in its current state, or, "as is." Seller makes no guarantee as to condition, mileage, year, model or any other circumstance regarding the automobile. Buyer acknowledges that the actual condition of the automobile may vary from any photographs, statements or representations made by Seller. Buyer represents that he/she had an opportunity to inspect the automobile prior to purchase and acknowledges that Seller has no responsibility for any defects or repairs, regardless of any representations (oral or otherwise) made by Seller. Furthermore, Buyer acknowledges that Seller will not provide a warranty of any type with regard to the automobile and, therefore, depending on the status of the manufacturers warranty, there may be no warranty of any type covering this automobile. 3. Purchase - Buyer is deemed to have purchased the automobile upon satisfaction of each of the following events: (1) Buyer and Seller have executed this Sales Agreement; (2) Seller has issued the registration (either Pennsylvania or in transit registration); (3) Buyer has executed the "Buyers Guide"; (4) Buyer has paid, in full, for the automobile; and, (5) Buyer has taken possession of the automobile. Buyer shall be deemed to have taken possession of the automobile, and therefore, any and all risks associated with possession, at the time the automobile is removed from Sellers premises, either by Buyer, Buyers agent or shipper (regardless or whether Seller arranged shipping on Buyers behalf). 4. Limited Warranty - THERE ARE NO WARRANTIES, EXPRESS OR IMPLIED, WRITTEN OR ORAL, INCLUDING, BUT NOT LIMITED TO, WARRANTIES OF MERCHANTABILITY OR FITNESS FOR ANY PARTICULAR PURPOSE. SELLER HEREBY DISCLAIMS ANY AND ALL REPRESENTATIONS AND WARRANTIES OF ANY KIND (WHETHER ARISING BY IMPLICATION OR BY OPERATION OF LAW). THIS SECTION SURVIVES THE TERMINATION OR CANCELLATION OF THIS SALES AGREEMENT. 5. Limitation of Liability - SELLERS LIABILITY FOR ANY LOSS OR DAMAGE ARISING OUT OF OR RESULTING FROM OR IN ANY WAY CONNECTED TO THIS TRANSACTION OR THE AUTOMOBILE CONTEMPLATED BY THIS TRANSACTION SHALL NOT EXCEED BUYERS PURCHASE PRICE, REGARDLESS OF WHETHER SUCH LIABILITY ARISES IN CONTRACT (INCLUDING, BUT NOT LIMITED TO, FAILURE OR DELAY IN PERFORMANCE OR DELIVERY DUE TO ANY CAUSE WHATSOEVER), TORT (INCLUDING, BUT NOT LIMITED TO, NEGLIGENCE OR STRICT LIABILITY) OR OTHERWISE. IN NO EVENT IS SELLER RESPONSIBLE TO BUYER FOR ANY INCIDENTAL, SPECIAL, EXEMPLARY OR CONSEQUENTIAL DAMAGES, INCLUDING, BUT NOT LIMITED TO, ALL DIRECT OR INDIRECT COSTS, REGARDLESS OF WHETHER THOSE DAMAGES WERE FORSEEABLE. ANY CLAIM BY BUYER SHALL BE DEEMED WAIVED UNLESS PRESENTED IN WRITING TO SELLER WITHIN THIRTY (30) DAYS FROM THE DATE BUYER TOOK POSSESSION. 6. Force Majeure - Seller shall not be liable for failure or delay in performance hereunder due in whole or in part to (i) acts of God, (ii) strikes, lockouts, or other labor disputes, (iii) civil commotion, sabotage, fire, flood, or explosion, (iv) acts of any governmental agency or authority, (v) unforeseen circumstances (vi) inability to obtain or delay in obtaining any necessary governmental approvals, permits or licenses, (vii) mechanical failure, (viii) or any other cause which is not within the reasonable control of Seller, whether or not of the kind specifically enumerated above. 7. Choice of Law, Jurisdiction & Venue - The transaction to which this document relates shall be governed by the substantive laws of the Commonwealth of Pennsylvania. In the event of any dispute between the parties arising out of this transaction, the parties agree and consent that the exclusive jurisdiction and venue for the resolution of such dispute shall be Pennsylvanias Court of Common Pleas, Montgomery County, or the United States District Court for the Eastern District of Pennsylvania. 8. Notices - No notice or other communication is sufficient to affect any rights, remedies or obligations of either party unless the notice or communication is in writing and (as elected by the party giving the notice or communication) is (i) personally delivered, (ii) transmitted by facsimile (with a receipt acknowledgment), (iii) transmitted by electronic computer mail, (iv) transmitted by a recognized courier service or (v) mailed in registered or certified form, to the party to which notice or communication is being given. Notice shall be delivered to the address specified below. 9. General - In the event that any provision contained herein is held to be invalid or unlawful, such provision shall be severed from the remaining provisions, which shall remain in full force and effect. No waiver of any provision hereof and no single waiver shall be held to constitute a continuing waiver or subsequent waiver. Contact us Sky Motor Cars LLC 431 South Bolmar St. West Chester, PA 19382 Phone:610-918-7225 Email Us Feel free to contact us at 610-918-7225 as many of our auctions are ended early by using the Buy It Now, Best Offer feature or because we will end the auction and sell to the highest bidder on eBay based upon receiving a reasonable offer on a No Reserve or Reserve auction format. 610-918-7225 Trade-Ins Sky Motor Cars will consider trade-ins on a case-by-case basis. Ad created by eCarList.com. Call 214-722-8200 to find out how eCarList can service your dealership. 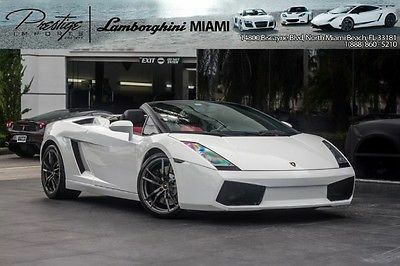 Photo Viewer 2013 Lamborghini Gallardo VIEW OTHER AUCTIONS ASK SELLER QUESTION Vital Information Year Make Model Mileage Engine 2013 Lamborghini Gallardo 899 5.2L DOHC DFI 40-Valve V10 Engine Exterior Interior Stock# VIN Giallo Midas Pearl Nero Perseus #A13156A ZHWGU5AU6DLA13156 Photos Description 2013 Lamborghini Gallardo Public Auto Brokers is pleased to be currently offering this 2013 Lamborghini Gallardo with 899 miles. This car has been dealer owned since new so the next owner will by the 1st registered owner of the car Rare and important options to note: 19" CORDELIA SHINY BLACK ALLOY WHEELS, 6-SPEED E-GEAR AUTOMATIC TRANSMISSION W/MANUAL SHIFT, GIALLO MIDAS PEARL, REAR VIEW CAMERA, CARBON FIBER ENGINE BAY TRIM, NAVIGATION SYSTEM W/BLUETOOTH, LIFTING SYSTEM This Lamborghini includes: 19" CORDELIA SHINY BLACK ALLOY WHEELS ($5850.00) STYLE PKG ($1560.00) BRANDING PKG ($910.00) PERFORATED LEATHER STEERING WHEEL ($650.00) 6-SPEED E-GEAR AUTOMATIC TRANSMISSION W/MANUAL SHIFT ($10,000.00) GIALLO MIDAS PEARL ($3390.00) REAR VIEW CAMERA ($2600.00) HOMELINK ($360.00) CARBON FIBER ENGINE BAY TRIM ($4235.00) TRAVEL PKG ($650.00) INTERIOR LEATHER PKG ($495.00) NAVIGATION SYSTEM W/BLUETOOTH ($3510.00) YELLOW BRAKE CALIPERS ($850.00) LIFTING SYSTEM ($5200.00) Anti-theft System ($665.00) GGT (2100.00) NERO PERSEUS, LEATHER SEAT TRIM ***FINANCING AVAILABLE! ***RATES AS LOW AS 1.89%***GET PRE-APPROVED NOW AT WWW.PUBLICAUTOBROKERS.COM *** *Note - For third party subscriptions or services, please contact the dealer for more information. * This Gallardo is for the discerning driver who demands the utmost of his vehicle. This 4WD-equipped Lamborghini handles any condition on- or off-road with the sure footedness of a mountain goat. With unequaled traction and stability, you'll drive with confidence in any weather with this Giallo Midas Pearl 2013 4WD Gallardo . Marked by excellent quality and features with unmistakable refined leather interior that added value and class to the Lamborghini Gallardo Unexpected repairs happen on all vehicles, but this Lamborghini Gallardo comes with the protection of the manufacturer's warranty. More information about the 2013 Lamborghini Gallardo: The true value in the Lamborghini Gallardo rests along three lines: incredible, spine-tingling performance, a design that's a rolling work of art, and the kind of exclusivity that pads the personal image of those who already have everything. The Lamborghini Gallardo Coupe and Spyder are powerful, flashy, all-wheel-drive supercars--and and they're among the fastest sports cars in the world, capable of topping 200 mph. And if the standard Gallardo just isn't hot enough for you, there are special Superleggera Coupe and Spyder Performante versions that are even lighter and better-performing--although at the expense of some comfort. Interesting features of this model are Exotic styling, performance bragging rights, exclusivity, ready for the race track, and all-wheel drive Contact Us Dealer Contact Public Auto Brokers Paul Bosco paul@publicautobrokers.com 972-741-7206 Optional Equipment 6-SPEED E-GEAR AUTOMATIC TRANSMISSION W/MANUAL SHIFT[G1E]Cost: $10000.00REAR VIEW CAMERA[7X9]Cost: $2600.00BRANDING PKG[NR1]Cost: $910.00HOMELINK[VC1]Cost: $360.00YELLOW BRAKE CALIPERS[PC1]Cost: $850.00 19" CORDELIA SHINY BLACK ALLOY WHEELS[F55]Cost: $5850.00CARBON FIBER ENGINE BAY TRIM[6H3]Cost: $4235.00INTERIOR LEATHER PKG[5MQ]Cost: $495.00TRAVEL PKG[PKC]Cost: $650.00GIALLO MIDAS PEARL[B8B8]Cost: $3390.00 NERO PERSEUS, LEATHER SEAT TRIM[___]NAVIGATION SYSTEM W/BLUETOOTH[PNL]Cost: $3510.00PERFORATED LEATHER STEERING WHEEL[2PV]Cost: $650.00STYLE PKG[VJ8]Cost: $1560.00 Standard Equipment ENTERTAINMENT USB & iPod connectors in glove compartment AM/FM/CD audio system -inc: MP3 capability, radio data system, digital card reader, (4) speakers EXTERIOR P235/35ZR19 Pirelli P ZERO front tires Body-colored door handles Auto-dimming, pwr-adjustable, pwr-folding heated mirrors Bi-xenon auto-leveling headlights w/washers Tire repair kit Front & rear body-colored bumpers 19" Apollo matte black alloy wheels Fixed rear window Variable intermittent windshield wipers Tinted glass P295/30ZR19 Pirelli P ZERO rear tires INTERIOR Front sport bucket seats -inc: 2-way pwr adjustment, head restraints Full floor console w/storage Instrumentation -inc: tachometer, external temp, digital clock, voltmeter, water temp, oil temp, oil pressure, trip computer, low tire pressure warning Auto pwr door locks Lighting -inc: front reading, dome light w/fade, illuminated entry Electrochromic rearview mirror Pwr remote fuel door release Nero Perseus, Leather seat trim Tilt/telescopic steering column Remote keyless entry Dual pwr windows w/one-touch up/down Trip computer -inc: average speed, average fuel economy, current fuel economy, range Rear defroster Automatic dual-zone climate control system w/residual heat recirculation, carbon filter Driver & passenger vanity mirror Alloy-trimmed shifter Remote trunk hatch release MECHANICAL Front & rear stabilizer bars Adaptive aluminum front & rear double wishbone suspension -inc: coil springs, height-adjustable dampers, anti-dive, anti-squat, anti-roll bar 6-speed E-Gear automatic transmission w/manual shift -inc: automatic clutch, sequential shift, paddle shifters, automatic mode Speed-sensitive-assist rack & pinion steering Brembo 4-wheel ventilated disc brakes Full-time four wheel drive w/four-wheel permanently locked hubs Front & rear limited slip differentials 5.2L DOHC DFI 40-valve V10 engine PROCESSING-OTHER **PRELIMINARY STANDARD EQUIPMENT** SAFETY Height-adjustable 3-point seat belts w/pretensioners Electronic stability control program Viscous and brake traction control system LED daytime running lights Driver & passenger multi-stage front airbags -inc: passenger airbag on/off switch Side airbags w/head airbag protection 4-wheel anti-lock braking system w/electronic brake force distribution Secure Online Credit Application Applying for a vehicle loan online is one of the quickest and easiest application methods. Our secure online application form is easy to complete, all you need are a few personal and employment details. Get started now. Below are a few of the other vehicles currently available from Public Auto Brokers Shipping Public Auto Brokers proudly recommends Earth Auto Shippers for your vehicle transport. Earth Auto Shippers is a fully licensed vehicle shipping company. Earth Auto Shippers offers "door-to-door" low-cost shipping services using enclosed and open trailers. View more info » About Us Our company is based on the belief that our customers' needs are of the utmost importance. We are committed to meeting those needs. Our team is comprised of experienced, professional salespeople that are committed to customer satisfaction in every aspect of the business. As a result, a high percentage of our business is from repeat customers and referrals. We would welcome the opportunity to earn your trust and deliver you the best customer service in the automotive industry. Please contact via email at paul@publicautobrokers.com or call to setup an appointment to see our exclusive listings 972.741.7206. Recommended Links Public Auto Brokers recommends financing from Cars Protection Plus. Please click below to apply online. We offer Extended Warranty Plans provided by Cars Protections Plus. You can choose from 6 Extended Warranty Plans which offer coverage up to 200,000 miles and between 3 months and 4 years of coverage. Ask us for more details or visit www.carsprotectionplus.com. Terms and Conditions Terms and Conditions PublicAutoBrokers is a registered eBay user name of Public Auto Brokers. Public Auto Brokers is a Texas Dealer operating under Texas License number P56231. Public Auto Brokers is located at 500 E Business Hwy 121, Lewisville, TX 75067. Public Auto Brokers' office can be reached at 972. 741.7206 At Auction Close Successful "winning" bidder must telephone 972.741.7206 within 1 hour after the auction has ended to verify purchase and make arrangements to complete the transaction. If communication is not attempted and/or no arrangements have been made, the vehicle can and will be made available to other potential buyers on a first-come, first-serve basis. Within (4) business days of the end of auction, full payment must be received either by cashiers-check, approved bank draft, or certified funds. If funds are not received, and an alternate arrangement has not been made, the vehicle can and will be made available to other potential buyers on a first-come, first-serve basis. Our Guarantee We have disclosed as much information as possible about this vehicle and aim to only carry quality pre-owned merchandise. Public Auto Brokers recommends all vehicles be inspected BEFORE leaving our facility. If upon personal and/or authorized professional inspection of the eBay purchased vehicle at our facility, buyer finds a substantial discrepancy between the published report and actual vehicle, we will either correct the problem at no charge, or work out a compromise, or refund all monies paid. Buyer will not be responsible for any eBay related fees and will be dismissed from any contractual obligation with eBay to purchase the vehicle if and only if inspection proves vastly different from published advertisement. Shipping - Transport of Vehicle Returns are allowed in the event the vehicle is shipped and you are dissatisfied. However, a 10% restocking fee applies and the return must take place within 7 days from receipt and the vehicle must have fewer than 200 miles difference upon return. Return shipping fees are the obligation of the buyer. Public Auto Brokers values your business! We want you to be completely satisfied with your online automotive experience from purchase to delivery. Please understand that Public Auto Brokers will arrange shipping for you as a value added service only. We are NOT the shipping company. All shipping questions and/or concerns should be addressed directly with the shipping company used to transport said vehicle. Should you be unsatisfied with your shipping service, please let us know! We aim to recommend only quality vendors. Accepted Forms of Payment Public Auto Brokers accepts cashiers’ checks, certified funds, or verified drafts from known/approved financial institutions. We also accept payment from online lenders Capital One Auto Finance, and eBay Finance. All buyers pay a $499.00 administrative fee, a $50.00 documentary fee plus Texas Vehicle Inventory Tax (multiply sale price by 0.0017489). Texas buyers must pay 6.25%sales tax plus applicable Texas fees. Out-of-state buyers are responsible for their own taxes, registration, etc. in their own states. Disclaimer All vehicles are sold "as-is" and without warranty. Some vehicles will have factory warranty remaining (will be stated in our description). All cars come with one master key unless otherwise stated. Vehicles come with books and/or manuals only if pictured in photo gallery and/or if stated in the advertisement. * We make every effort to present information that is accurate. However, it is based on data provided by the vehicle VIN decoding and/or other sources and therefore exact configuration, color, specifications & accessories should be used as a guide only and are not guaranteed. Under no circumstances will we be liable for any inaccuracies, claims or losses of any nature. Furthermore, inventory is subject to prior sale and prices are subject to change without notice. Prices do not include taxes, registration fees, finance and/or documentation charges, or shipping fees. To ensure your complete satisfaction, please verify accuracy prior to purchase. ** Public Auto Brokers also offers and recommends affordable extended warranties, please call us for more details. ** *** Public Auto Brokers has all their vehicles for sale locally and reserve the right to sell it locally before auctions end. We don't try to short an auction but local buyers can/will pay buy-it now price without going through E-bay. In the situation that a car sells locally but hasn't been removed yet and it sells online, the online sale is void and any money paid will be refunded in full. We work hard to keep our inventory managed correctly online but in the case of this happening, we want to disclose how it will be handled so that no negative feedback will be produced. Online Bidders are entering into a legal and binding contract to purchase the vehicle described above. If you do not intend to purchase this item, DO NOT BID! Ad created by eCarList.com. Call 214-722-8200 to find out how eCarList can service your dealership. 2013 Lamborghini Aventador Vital Information Year Make Model Mileage Engine 2013 Lamborghini Aventador 4,444 6.5L V12 Engine Exterior Interior Stock# VIN Verde Ithica Verde Pan/Nero Ade #A01447 ZHWUC1ZD8DLA01447 Photos Contact Us Dealer Contact Prestige Imports Standard Equipment ENTERTAINMENT Navigation system Wireless phone connectivity Multimedia HMI system w/navigation -inc: AM/FM radio, CD/MP3/DVD player, aux audio input, LCD display, traffic data, iPod connection, USB port, Bluetooth (7) speakers EXTERIOR Black bodyside moldings 19" front & 20" rear silver alloy wheels Pwr-operated rear spoiler P255/35ZR19 front & P335/30ZR20 rear Pirelli P-Zero tires Body-colored bumpers Body-colored, heated pwr mirrors Bi-xenon HID projector beam automatic headlights -inc: washers Variable intermittent front windshield wipers INTERIOR Floor mats Pwr windows Pwr door locks Dual visor vanity mirrors Aluminum instrument panel insert Pwr-adjustable bucket seats Covered console storage Leather seat trim Remote keyless entry w/2-stage unlock, illuminated entry Auto-dimming rearview mirror Security system w/immobilizer Tilt/telescoping leather & aluminum steering wheel Instrumentation -inc: tachometer, outside temp, tire pressure warning, trip computer Auto climate control Driver-selectable ride control Leather console insert MECHANICAL Speed-sensing electro-hydraulic pwr rack-&-pinion steering 4-wheel ceramic disc brakes -inc: 6-piston front calipers, 4-piston rear calipers Front & rear double wishbone suspension w/stabilizer bars Electronic variable valve timing Haldex generation IV all-wheel drive system 6.5L V12 engine 7-speed dual-clutch transmission w/manual override Carbon fiber monocoque frame w/aluminum front and rear subframes SAFETY Dual side-impact head/thorax airbags 4-wheel anti-lock brakes Dual front knee airbags Electronic stability control Traction control Dual-stage front airbags -inc: passenger sensor Secure Online Credit Application Applying for a vehicle loan online is one of the quickest and easiest application methods. Our secure online application form is easy to complete, all you need are a few personal and employment details. Get started now. Below are a few of the other vehicles currently available from Prestige Imports About Prestige Imports Prestige Imports has served luxury vehicle owners of South Florida for more than three decades, and during this period has cemented its reputation as one of America's premier automotive retailers. The Prestige Imports family includes four premium vehicle franchises in North Miami Beach, including one of North America's leading Lamborghini dealerships and the nation's top-selling Audi dealership. In addition to its new vehicle offerings, Prestige Imports hosts an impressive inventory of luxury pre-owned vehicles from such esteemed brands as Aston Martin, Audi, Bentley, BMW, Ferrari, Jaguar, Lamborghini, Land Rover, Lotus, Maserati, Maybach, Mercedes-Benz, Porsche, Rolls-Royce and Saleen. To visit the Web sites of our dealerships, please select from the brand logos on this page or choose from the following links: Lamborghini Miami (Lamborghini) Prestige Audi (Audi) Lotus Miami (Lotus) Pagani Miami (Pagani) Feel free to follow us on Instagram: @prestigeimports Ad created by eCarList.com. Call 214-722-8200 to find out how eCarList can service your dealership. 2013 Lamborghini Gallardo Vital Information Year Make Model Mileage Engine 2013 Lamborghini Gallardo 3,882 5.2L DOHC DFI 40-Valve V10 Engine Exterior Interior Stock# VIN Bianco Monocerous #DLA12680 ZHWGU5BZ4DLA12680 Vehicle Video Photos Description 2013 Lamborghini Gallardo Thank you for your interest in one of Prestige Imports's online offerings. Please continue for more information regarding this 2013 Lamborghini Gallardo with 3,882 miles. Drive home in your new pre-owned vehicle with the confidence of knowing you're fully backed by the CARFAX Buyback Guarantee. This Gallardo is for the discerning driver who demands the utmost of his vehicle. Added comfort with contemporary style is the leather interior to heighten the quality and craftsmanship for the Lamborghini Gallardo This gently driven vehicle has been well-kept and still has the showroom shine. If you're looking for world-class speed, acceleration, cornering and handling, don't blink because you'll miss this truly amazing automobile. Time is money, and thanks to the navigation system on this Lamborghini Gallardo, you'll be spending a whole lot less time getting to your destination. There are "other vehicles" and then there is the Gallardo . It is one of the most unique vehicles on the market, and you would be hard pressed to find another dealer offering something quite like this Lamborghini. The upgraded wheels on this vehicle offer improved handling and an attractive appearance. More information about the 2013 Lamborghini Gallardo: The true value in the Lamborghini Gallardo rests along three lines: incredible, spine-tingling performance, a design that's a rolling work of art, and the kind of exclusivity that pads the personal image of those who already have everything. The Lamborghini Gallardo Coupe and Spyder are powerful, flashy, all-wheel-drive supercars--and and they're among the fastest sports cars in the world, capable of topping 200 mph. And if the standard Gallardo just isn't hot enough for you, there are special Superleggera Coupe and Spyder Performante versions that are even lighter and better-performing--although at the expense of some comfort. Strengths of this model include Exotic styling, performance bragging rights, exclusivity, ready for the race track, and all-wheel drive Contact Us Dealer Contact Prestige Imports CHRIS ATWOOD CATWOOD@PRESTIGEIMPORTS.COM 3059471000 Carfax Standard Equipment ENTERTAINMENT USB & iPod connectors in glove compartment AM/FM/CD audio system -inc: MP3 capability, radio data system, digital card reader, (4) speakers EXTERIOR Tinted glass 19" Scorpius dark gray alloy wheels P235/35ZR19 Pirelli P ZERO front tires Tire repair kit Fixed rear window Variable intermittent windshield wipers Front & rear body-colored bumpers Body-colored door handles Bi-xenon auto-leveling headlights w/washers Auto-dimming, pwr-adjustable, pwr-folding heated mirrors P295/30ZR19 Pirelli P ZERO rear tires INTERIOR Dual pwr windows w/one-touch up/down Front sport bucket seats -inc: 2-way pwr adjustment, head restraints Electrochromic rearview mirror Nero Perseus, Leather seat trim Instrumentation -inc: tachometer, external temp, digital clock, voltmeter, water temp, oil temp, oil pressure, trip computer, low tire pressure warning Trip computer -inc: average speed, average fuel economy, current fuel economy, range Auto pwr door locks Pwr remote fuel door release Alloy-trimmed shifter Tilt/telescopic steering column Driver & passenger vanity mirror Full floor console w/storage Rear defroster Remote keyless entry Automatic dual-zone climate control system w/residual heat recirculation, carbon filter Lighting -inc: front reading, dome light w/fade, illuminated entry Remote trunk hatch release MECHANICAL Adaptive aluminum front & rear double wishbone suspension -inc: coil springs, height-adjustable dampers, anti-dive, anti-squat, anti-roll bar Brembo 4-wheel ventilated disc brakes Speed-sensitive-assist rack & pinion steering Front & rear stabilizer bars 5.2L DOHC DFI 40-valve V10 engine Rear wheel drive Limited slip rear differential PROCESSING-OTHER **PRELIMINARY STANDARD EQUIPMENT** SAFETY LED daytime running lights Viscous and brake traction control system Side airbags w/head airbag protection 4-wheel anti-lock braking system w/electronic brake force distribution Driver & passenger multi-stage front airbags -inc: passenger airbag on/off switch Height-adjustable 3-point seat belts w/pretensioners Electronic stability control program Secure Online Credit Application Applying for a vehicle loan online is one of the quickest and easiest application methods. Our secure online application form is easy to complete, all you need are a few personal and employment details. Get started now. Below are a few of the other vehicles currently available from Prestige Imports About Prestige Imports Prestige Imports has served luxury vehicle owners of South Florida for more than three decades, and during this period has cemented its reputation as one of America's premier automotive retailers. The Prestige Imports family includes four premium vehicle franchises in North Miami Beach, including one of North America's leading Lamborghini dealerships and the nation's top-selling Audi dealership. In addition to its new vehicle offerings, Prestige Imports hosts an impressive inventory of luxury pre-owned vehicles from such esteemed brands as Aston Martin, Audi, Bentley, BMW, Ferrari, Jaguar, Lamborghini, Land Rover, Lotus, Maserati, Maybach, Mercedes-Benz, Porsche, Rolls-Royce and Saleen. To visit the Web sites of our dealerships, please select from the brand logos on this page or choose from the following links: Lamborghini Miami (Lamborghini) Prestige Audi (Audi) Lotus Miami (Lotus) Pagani Miami (Pagani) Feel free to follow us on Instagram: @prestigeimports Ad created by eCarList.com. Call 214-722-8200 to find out how eCarList can service your dealership. 2012 Lamborghini Gallardo Superleggera Vital Information Year Make Model Mileage Engine 2012 Lamborghini Gallardo Superleggera 1,195 5.2L DOHC DFI 40-Valve V10 Engine Exterior Interior Stock# VIN Grigio Telesto Nero Perseus #9605A ZHWGU7AJ3CLA11834 Vehicle Video Photos Description 2012 Lamborghini Gallardo Superleggera This 2012 Lamborghini Gallardo Superleggera is offered exclusively by Prestige Imports This 2012 Lamborghini Gallardo comes with a CARFAX Buyback Guarantee, which means you can buy with confidence. This Gallardo Superleggera's level of quality is not meant for just anyone. It's meant for the person who strives for a classy, comfortable, and luxurious car. This 4WD-equipped Lamborghini handles any condition on- or off-road with the sure footedness of a mountain goat. With unequaled traction and stability, you'll drive with confidence in any weather with this Grigio Telesto 2012 4WD Gallardo Superleggera. Rare is the vehicle that has been driven so gently and maintained so meticulously as this pre-owned beauty. This 2012 Lamborghini qualifies for the manufacturer warranty, which ensures that you're going to receive a high-quality vehicle for a great price -- two things Prestige Imports strives to provide to every customer. A true feat of engineering, this Gallardo Superleggera has otherworldly acceleration, prodigious power and is accompanied by the prestigious reputation of Lamborghini. Although it may not make much sense, this vehicle will undoubtedly provide a memorable experience every time you drive it. You'll quickly realize how much you will need a navigation system once you are stopping for directions or looking up addresses on your phone instead of looking at the road. This Gallardo Superleggera features a navigation system that will free you of these unnecessary headaches. The first thing anyone notices about your car is the paint job and this car's is near perfect. Sophistication, performance, style and class all wrapped up in this rare Lamborghini Gallardo. More information about the 2012 Lamborghini Gallardo: The true value in the Lamborghini Gallardo rests along three lines: incredible, spine-tingling performance, a design that's a rolling work of art, and the kind of exclusivity that pads the personal image of those who already have everything. The Lamborghini Gallardo Coupe and Spyder (convertible) are powerful, flashy, all-wheel-drive supercars--and and they're among the fastest sports cars in the world, capable of topping 200 mph. And if the standard Gallardo just isn't hot enough for you, there are special Superleggera Coupe and Spyder Performante versions that are even lighter and better-performing--although at the expense of some comfort. Strengths of this model include performance bragging rights, ready for the race track, Exotic styling, exclusivity, and all-wheel drive Contact Us Dealer Contact Prestige Imports Carfax Standard Equipment ENTERTAINMENT AM/FM/CD audio system -inc: MP3 capability, radio data system, digital card reader, (4) speakers USB & iPod connectors in glove compartment EXTERIOR Fixed rear window Body-colored door handles Auto-dimming, pwr-adjustable, pwr-folding heated mirrors Tinted glass Bi-xenon auto-leveling headlights w/washers Front & rear body-colored bumpers Tire repair kit Variable intermittent windshield wipers INTERIOR Full floor console w/storage Lighting -inc: front reading, dome light w/fade, illuminated entry Nero Perseus, Leather seat trim Tilt/telescopic steering column Remote keyless entry Pwr remote fuel door release Driver & passenger vanity mirror Remote trunk hatch release Dual pwr windows w/one-touch up/down Rear defroster Instrumentation -inc: tachometer, external temp, digital clock, voltmeter, water temp, oil temp, oil pressure, trip computer, low tire pressure warning Front sport bucket seats -inc: 2-way pwr adjustment, head restraints Auto pwr door locks Alloy-trimmed shifter Automatic dual-zone climate control system w/residual heat recirculation, carbon filter MECHANICAL Lifting system Speed-sensitive-assist rack & pinion steering Front & rear stabilizer bars 5.2L DOHC DFI 40-valve V10 engine Front & rear limited slip differentials Adaptive aluminum front & rear double wishbone suspension -inc: coil springs, height-adjustable dampers, anti-dive, anti-squat, anti-roll bar Full-time four wheel drive w/four-wheel permanently locked hubs Brembo 4-wheel ventilated disc brakes 6-speed E-Gear automatic transmission w/manual shift -inc: automatic clutch, sequential shift, paddle shifters, automatic mode PROCESSING-OTHER **PRELIMINARY STANDARD EQUIPMENT** SAFETY LED daytime running lights Viscous and brake traction control system Side airbags w/head airbag protection Tire pressure monitoring system Driver & passenger multi-stage front airbags -inc: passenger airbag on/off switch Electronic stability control program 4-wheel anti-lock braking system w/electronic brake force distribution Secure Online Credit Application Applying for a vehicle loan online is one of the quickest and easiest application methods. Our secure online application form is easy to complete, all you need are a few personal and employment details. Get started now. Below are a few of the other vehicles currently available from Prestige Imports About Prestige Imports Prestige Imports has served luxury vehicle owners of South Florida for more than three decades, and during this period has cemented its reputation as one of America's premier automotive retailers. The Prestige Imports family includes four premium vehicle franchises in North Miami Beach, including one of North America's leading Lamborghini dealerships and the nation's top-selling Audi dealership. In addition to its new vehicle offerings, Prestige Imports hosts an impressive inventory of luxury pre-owned vehicles from such esteemed brands as Aston Martin, Audi, Bentley, BMW, Ferrari, Jaguar, Lamborghini, Land Rover, Lotus, Maserati, Maybach, Mercedes-Benz, Porsche, Rolls-Royce and Saleen. To visit the Web sites of our dealerships, please select from the brand logos on this page or choose from the following links: Lamborghini Miami (Lamborghini) Prestige Audi (Audi) Lotus Miami (Lotus) Pagani Miami (Pagani) Feel free to follow us on Instagram: @prestigeimports Ad created by eCarList.com. Call 214-722-8200 to find out how eCarList can service your dealership. 2014 Lamborghini Aventador Roadster Vital Information Year Make Model Mileage Engine 2014 Lamborghini Aventador Roadster 1,292 Exterior Interior Stock# VIN Nero Nemesis Matt Finish Giallo Taurus/Nero Ade #ELA02462 ZHWUR1ZD9ELA02462 Photos Description 2014 Lamborghini Aventador Roadster Prestige Imports is pleased to be currently offering this 2014 Lamborghini Aventador Roadster with 1,292 miles. Every day feels like Saturday when you're driving a well-maintained, plush convertible like this one. The Aventador Roadster 's pristine good looks were combined with the Lamborghini high standard of excellence in order to make this a unique find. When driving an all wheel drive vehicle, such as this Lamborghini Aventador Roadster , superior acceleration, traction, and control come standard. Added comfort with contemporary style is the leather interior to heighten the quality and craftsmanship for the Lamborghini Aventador Roadster With an efficient and easy to use navigation system, this Lamborghini Aventador Roadster will help get you from Point A to Point B in no time flat. This Lamborghini Aventador Roadster is beautiful and the interior is clean with virtually no flaws. Get more for your money with this well appointed vehicle, including a factory warranty. Most vehicles are forgettable, but then there is the 2014 Lamborghini Aventador Roadster . This high-performance vehicle provides a memorable experience each time you drive it. The engineers at Lamborghini, without question, designed a masterful automobile that provides all of the "essential perks" needed for someone like you. The Aventador Roadster is exactly what you would expect out of a Lamborghini. It's decadently opulent, meticulously engineered and unapologetically grandiose. Contact Us Dealer Contact Prestige Imports Standard Equipment ENTERTAINMENT Real-Time Traffic Display 4 Speakers 1 LCD Monitor In The Front Bluetooth Wireless Phone Connectivity Concealed Antenna Radio w/Clock and DVD-Audio Multimedia HMI System w/Navigation -inc: TFT-LCD display, traffic data, iPod connection, USB interface and Bluetooth EXTERIOR Manual Convertible Hard Top w/Lining, Glass Rear Window and Automatic Roll-Over Protection Variable Intermittent Wipers Fully Automatic Projector Beam High Intensity Low/High Beam Daytime Running Auto-Leveling Headlamps w/Washer Power Rear Window Body-Colored Power Heated Side Mirrors w/Power Folding Body-Colored Door Handles Spare Tire Air Compressor Black Grille Tires: P255/35ZR19 Front & P335/30ZR20 Rear Pirelli P-Zero Manual Targa Composite 1st Row Sunroof Clearcoat Paint LED Brakelights Body-Colored Front Bumper w/Black Rub Strip/Fascia Accent Power Spoiler Black Bodyside Moldings Spare Tire Tire Inflator Body-Colored Rear Bumper w/Black Rub Strip/Fascia Accent Composite/Aluminum Panels Black Side Windows Trim Light Tinted Glass Wheels: Front 19" x 9"/Rear 20" x 12" Iperione Silver Alloy INTERIOR Valet Function Power Door Locks Cargo Features -inc: Spare Tire Tire Inflator Fixed Rear Windows Interior Trim -inc: Deluxe Sound Insulation, Aluminum Instrument Panel Insert, Aluminum Door Panel Insert, Leather Console Insert, Aluminum Interior Accents and Leather Upholstered Dashboard Remote Releases -Inc: Power Trunk/Hatch and Power Fuel Front Map Lights Fixed Front Head Restraints Locking Glove Box Remote Keyless Entry w/Integrated Key Transmitter, 2 Door Curb/Courtesy and Illuminated Entry Power 1st Row Windows Full Leatherette Headliner 2-Way Power Driver Seat Analog Display Day-Night Auto-Dimming Rearview Mirror Perimeter Alarm Leather Bucket Seats -inc: Manual seats w/electrically adjustable backrest Manual Tilt/Telescoping Steering Column Full Carpet Floor Covering -inc: Carpet Front Floor Mats Redundant Digital Speedometer 1 12V DC Power Outlet Front Center Armrest Outside Temp Gauge Fade-To-Off Interior Lighting Integrated Navigation System Leather Front Seats w/Leather Back Material Engine Immobilizer Full Floor Console w/Covered Storage, Mini Overhead Console and 1 12V DC Power Outlet Systems Monitor 2-Way Power Passenger Seat -inc: Power Recline and Manual Fore/Aft Movement Trip Computer Gauges -inc: Speedometer, Odometer, Oil Pressure, Engine Coolant Temp, Tachometer, Oil Temperature, Trip Odometer and Trip Computer Leather Door Trim Insert 2-Way Power Driver Seat -inc: Power Recline and Manual Fore/Aft Movement 2-Way Power Passenger Seat Cargo Space Lights Cargo Features -inc: Spare Tire Air Compressor Sport Leather/Aluminum Steering Wheel Driver And Passenger Visor Vanity Mirrors Driver Foot Rest Carpet Floor Trim and Carpet Mat Automatic Air Conditioning MECHANICAL Engine Auto Stop-Start Feature 4-Wheel Disc Brakes w/4-Wheel ABS, Front And Rear Vented Discs, Hill Hold Control, Ceramic Discs and Ceramic Discs Transmission w/Driver Selectable Mode and Sequential Shift Control w/Steering Wheel Controls Automatic w/Driver Control Height Adjustable Driver Control Ride Control Sport Tuned Suspension Double Wishbone Pushrod Rear Suspension w/Coil Springs Transmission: 7-Speed Automated Manual w/ISR -inc: ISR: Independent Shifting Rods Engine Oil Cooler 23.8 Gal. Fuel Tank Ohlins Brand Name Shock Absorbers Electro-Hydraulic Power Assist Speed-Sensing Steering Double Wishbone Pushrod Front Suspension w/Coil Springs Electro-Mechanical Limited Slip Differential Engine: 6.5L V12 DOHC SMPI -inc: Mid-mounted aluminum alloy Permanent Locking Hubs Battery w/Run Down Protection 2.86 Axle Ratio Front And Rear Anti-Roll Bars Dual Stainless Steel Exhaust w/Polished Tailpipe Finisher Full-Time All-Wheel Drive SAFETY Side Impact Beams ABS And Driveline Traction Control Tire Specific Low Tire Pressure Warning Outboard Front Lap And Shoulder Safety Belts -inc: Height Adjusters and Pretensioners Dual Stage Driver And Passenger Seat-Mounted Side Airbags Electronic Stability Control (ESC) Driver And Passenger Side Airbag Head Extension and Driver And Passenger Knee Airbag Driver And Passenger Side Airbag Head Extension, Driver And Passenger Knee Airbag Dual Stage Driver And Passenger Front Airbags Secure Online Credit Application Applying for a vehicle loan online is one of the quickest and easiest application methods. Our secure online application form is easy to complete, all you need are a few personal and employment details. Get started now. Below are a few of the other vehicles currently available from Prestige Imports About Prestige Imports Prestige Imports has served luxury vehicle owners of South Florida for more than three decades, and during this period has cemented its reputation as one of America's premier automotive retailers. The Prestige Imports family includes four premium vehicle franchises in North Miami Beach, including one of North America's leading Lamborghini dealerships and the nation's top-selling Audi dealership. In addition to its new vehicle offerings, Prestige Imports hosts an impressive inventory of luxury pre-owned vehicles from such esteemed brands as Aston Martin, Audi, Bentley, BMW, Ferrari, Jaguar, Lamborghini, Land Rover, Lotus, Maserati, Maybach, Mercedes-Benz, Porsche, Rolls-Royce and Saleen. To visit the Web sites of our dealerships, please select from the brand logos on this page or choose from the following links: Lamborghini Miami (Lamborghini) Prestige Audi (Audi) Lotus Miami (Lotus) Pagani Miami (Pagani) Feel free to follow us on Instagram: @prestigeimports Ad created by eCarList.com. Call 214-722-8200 to find out how eCarList can service your dealership. 2013 Lamborghini Gallardo Vital Information Year Make Model Mileage Engine 2013 Lamborghini Gallardo 3,882 5.2L DOHC DFI 40-Valve V10 Engine Exterior Interior Stock# VIN Unknown Color #DLA12680 ZHWGU5BZ4DLA12680 Photos Contact Us Dealer Contact Prestige Imports Carfax Standard Equipment ENTERTAINMENT USB & iPod connectors in glove compartment AM/FM/CD audio system -inc: MP3 capability, radio data system, digital card reader, (4) speakers EXTERIOR Tinted glass 19" Scorpius dark gray alloy wheels P235/35ZR19 Pirelli P ZERO front tires Tire repair kit Fixed rear window Variable intermittent windshield wipers Front & rear body-colored bumpers Body-colored door handles Bi-xenon auto-leveling headlights w/washers Auto-dimming, pwr-adjustable, pwr-folding heated mirrors P295/30ZR19 Pirelli P ZERO rear tires INTERIOR Dual pwr windows w/one-touch up/down Front sport bucket seats -inc: 2-way pwr adjustment, head restraints Electrochromic rearview mirror Nero Perseus, Leather seat trim Instrumentation -inc: tachometer, external temp, digital clock, voltmeter, water temp, oil temp, oil pressure, trip computer, low tire pressure warning Trip computer -inc: average speed, average fuel economy, current fuel economy, range Auto pwr door locks Pwr remote fuel door release Alloy-trimmed shifter Tilt/telescopic steering column Driver & passenger vanity mirror Full floor console w/storage Rear defroster Remote keyless entry Automatic dual-zone climate control system w/residual heat recirculation, carbon filter Lighting -inc: front reading, dome light w/fade, illuminated entry Remote trunk hatch release MECHANICAL Adaptive aluminum front & rear double wishbone suspension -inc: coil springs, height-adjustable dampers, anti-dive, anti-squat, anti-roll bar 6-speed manual transmission -inc: floor shifter Brembo 4-wheel ventilated disc brakes Speed-sensitive-assist rack & pinion steering Front & rear stabilizer bars 5.2L DOHC DFI 40-valve V10 engine Rear wheel drive Limited slip rear differential PROCESSING-OTHER **PRELIMINARY STANDARD EQUIPMENT** SAFETY LED daytime running lights Viscous and brake traction control system Side airbags w/head airbag protection 4-wheel anti-lock braking system w/electronic brake force distribution Driver & passenger multi-stage front airbags -inc: passenger airbag on/off switch Height-adjustable 3-point seat belts w/pretensioners Electronic stability control program Secure Online Credit Application Applying for a vehicle loan online is one of the quickest and easiest application methods. Our secure online application form is easy to complete, all you need are a few personal and employment details. Get started now. Below are a few of the other vehicles currently available from Prestige Imports About Prestige Imports Prestige Imports has served luxury vehicle owners of South Florida for more than three decades, and during this period has cemented its reputation as one of America's premier automotive retailers. The Prestige Imports family includes four premium vehicle franchises in North Miami Beach, including one of North America's leading Lamborghini dealerships and the nation's top-selling Audi dealership. In addition to its new vehicle offerings, Prestige Imports hosts an impressive inventory of luxury pre-owned vehicles from such esteemed brands as Aston Martin, Audi, Bentley, BMW, Ferrari, Jaguar, Lamborghini, Land Rover, Lotus, Maserati, Maybach, Mercedes-Benz, Porsche, Rolls-Royce and Saleen. To visit the Web sites of our dealerships, please select from the brand logos on this page or choose from the following links: Lamborghini Miami (Lamborghini) Prestige Audi (Audi) Lotus Miami (Lotus) Pagani Miami (Pagani) Feel free to follow us on Instagram: @prestigeimports Ad created by eCarList.com. Call 214-722-8200 to find out how eCarList can service your dealership. 2006 Lamborghini Gallardo Vital Information Year Make Model Mileage Engine 2006 Lamborghini Gallardo 10,803 5.0L DOHC SMPI 4-Valve Aluminum 10-Cyl Engine Exterior Interior Stock# VIN Yellow Black #83207A ZHWGU12T96LA03061 Vehicle Video Photos Description 2006 Lamborghini Gallardo This outstanding example of a 2006 Lamborghini Gallardo is offered by Prestige Imports. Put performance, safety, beauty, sophistication and all the right amenities into a car, and here it is! Now you can own luxury without the luxury price tag! Tackle any terrain with this 4WD Gallardo . Off the road or on the parkway, you'll drive with confidence no matter the weather conditions or landscape. This Lamborghini Gallardo is in great condition both inside and out. No abnormal "wear and tear". A true feat of engineering, this Gallardo has otherworldly acceleration, prodigious power and is accompanied by the prestigious reputation of Lamborghini. Although it may not make much sense, this vehicle will undoubtedly provide a memorable experience every time you drive it. The best part about navigation systems like the one that comes in this car? You don't have to try to fold them up and stuff them back into the glove box. Finding a pre-owned vehicle with flawless paint is a rare find, but you've done just that. The paint on this Gallardo is flawless; no scratches, no blemishes, no need to spend extra money on touch ups. Unique and nearly impossible to find, this 2006 Gallardo is a collector's dream come true. Contact Us Dealer Contact Prestige Imports CHRIS ATWOOD CATWOOD@PRESTIGEIMPORTS.COM 3059471000 Carfax Standard Equipment EXTERIOR Front air dams Pwr folding heated mirrors Variable intermittent windshield wiper Electronically controlled rear spoiler High Intensity Discharge (HID) headlights INTERIOR Full floor carpeting Leather seat trim AM/FM stereo w/CD changer-inc: cassette player Front bucket seats w/multi-adjustable pwr seats Pwr door locks Electrochromic rearview mirror Rear defroster Pwr windows Warning lights-inc: check engine, low fuel, door/hood open Instrumentation display-inc: tachometer, external temp, remaining fuel distance Leather wrapped tilt/telescopic steering wheel Dual zone climate control system In-glass antenna MECHANICAL Lamborghini electronic engine management (LIE) Front automatic brake differential (ABD) Pwr rack & pinion steering MPFI fuel injection system w/individual static ignition Pwr 4-wheel Brembo vented disc brakes w/(8) piston front/(4) piston rear calipers Variable-geometry intake system (VIS) 5.0L DOHC SMPI 4-valve aluminum 10-cyl engine Drive by wire throttle control 23.8 gallon fuel tank Cooling system-inc: (2) water radiators, gearbox oil cooler, engine oil cooler Electronic stability program (ESP) Aluminum space frame 19" x 8.5" front/19" x 11" rear aluminum wheels Automatic slip control (ASR) Front/rear aluminum double wishbone suspension-inc: coil springs, anti-dive, anti-squat, anti-roll bar, Koni FSD dampers Front/rear stabilizer bars Variable valve timing (VVT) Dry sump lubrication system 4-wheel drive Limited slip front/rear differential SAFETY Trunk anti-trap device Side airbags w/head protection Driver/front passenger dual stage airbags Viscous traction system Anti-lock braking system (ABS) w/electronic brake force distribution Secure Online Credit Application Applying for a vehicle loan online is one of the quickest and easiest application methods. Our secure online application form is easy to complete, all you need are a few personal and employment details. Get started now. Below are a few of the other vehicles currently available from Prestige Imports About Prestige Imports Prestige Imports has served luxury vehicle owners of South Florida for more than three decades, and during this period has cemented its reputation as one of America's premier automotive retailers. The Prestige Imports family includes four premium vehicle franchises in North Miami Beach, including one of North America's leading Lamborghini dealerships and the nation's top-selling Audi dealership. In addition to its new vehicle offerings, Prestige Imports hosts an impressive inventory of luxury pre-owned vehicles from such esteemed brands as Aston Martin, Audi, Bentley, BMW, Ferrari, Jaguar, Lamborghini, Land Rover, Lotus, Maserati, Maybach, Mercedes-Benz, Porsche, Rolls-Royce and Saleen. To visit the Web sites of our dealerships, please select from the brand logos on this page or choose from the following links: Lamborghini Miami (Lamborghini) Prestige Audi (Audi) Lotus Miami (Lotus) Pagani Miami (Pagani) Feel free to follow us on Instagram: @prestigeimports Ad created by eCarList.com. Call 214-722-8200 to find out how eCarList can service your dealership.